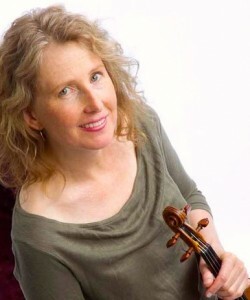 Kate Stenberg’s solo violin playing has been described by NewMusicBox as “highly virtuosic and deeply communicative…full of character and presence.” Her acclaimed CD, “Scenes from a New Music Séance” (with pianist Eva-Maria Zimmermann), released by Other Minds in 2012, includes several world premieres and assorted new music – a genre to which she has been deeply committed. Formally as first violinist in the renowned Del Sol String Quartet, with whom she toured nationally and internationally for the past 22 years, Kate performed premieres of well over 100 new works and recorded numerous CDs. She was a founding member of several contemporary music groups, including the Left Coast Chamber Ensemble and the Real Vocal String Quartet. In addition to her recordings with Del Sol String Quartet, she has recorded with many other ensembles, including the San Francisco Contemporary Music Players, New Music Works and Stratos, and with the late Indian sarod master Ali Akbar Khan. Kate was raised in a dynamic family of professional musicians and received degrees from the San Francisco Conservatory of Music and the Eastman School of Music.